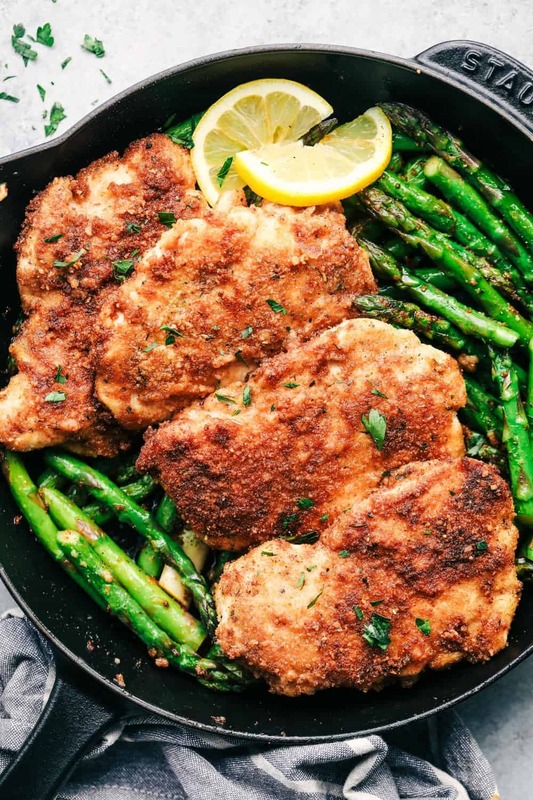 Crispy Garlic Chicken with Asparagus is an easy 30 minute meal with crispy breaded chicken and crisp and tender asparagus. This is a family favorite meal! We love asparagus in our family. 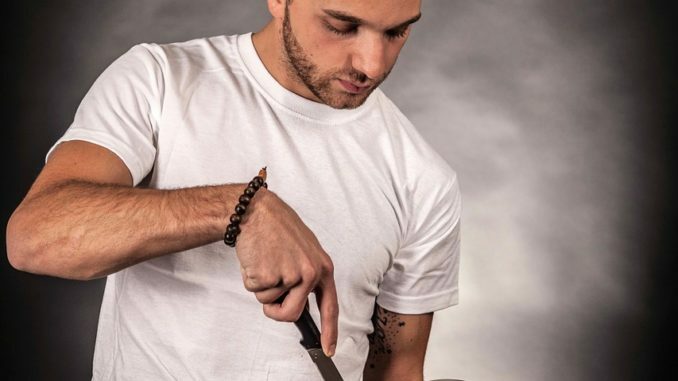 Be sure to try these other techniques to cook asparagus as your side. Bacon Wrapped Asparagus, Roasted Lemon Parmesan Asparagus, or Parmesan Herb Asparagus Fries. I am officially a dance mom. My little girl had her dance recital last week and I had to learn the ins and outs of what is required at a dance recital. I made the mistake of not putting any makeup on her for her pictures and quickly learned that they need full-on makeup for their performances. It is sure crazy putting on makeup for your three-year-old, but she sure looked cute. I think three-year-olds are so funny to watch perform. They just follow along and make up their own thing and look so cute while doing it. We had so much fun watching her and hopefully, I won’t be too crazy in my new role as a dance mom! ha! We had this crispy garlic chicken right before her performance and it is a family favorite meal. I love it because it is ready in just 30 minutes and a meal that my entire family loves. 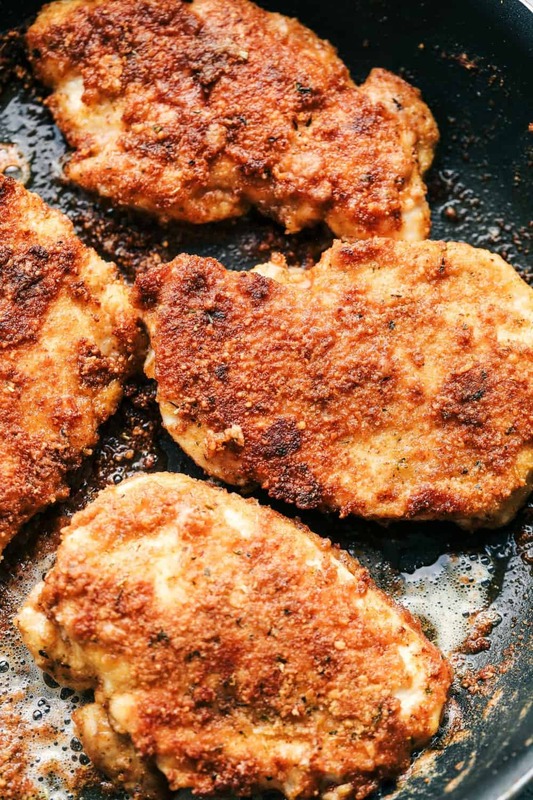 How do you make fried chicken in a pan? You need a good breading that will stick to the chicken as you fry it in the pan. Dip the chicken in the butter, then the breadcrumb mixture, and place it in a skillet with two tablespoons of melted butter. Cook on each side for 3-4 minutes until it is crispy and brown. Do not flip the chicken too soon so that the outside can get crispy before turning. How do I cook fresh asparagus on the stove? Once the chicken is done, set aside on a plate. Add 2 tablespoons of butter back to the pan and add asparagus. Cook for about 10 minutes turning the asparagus until it is tender. I can count on this meal to be a huge hit every time I make it. 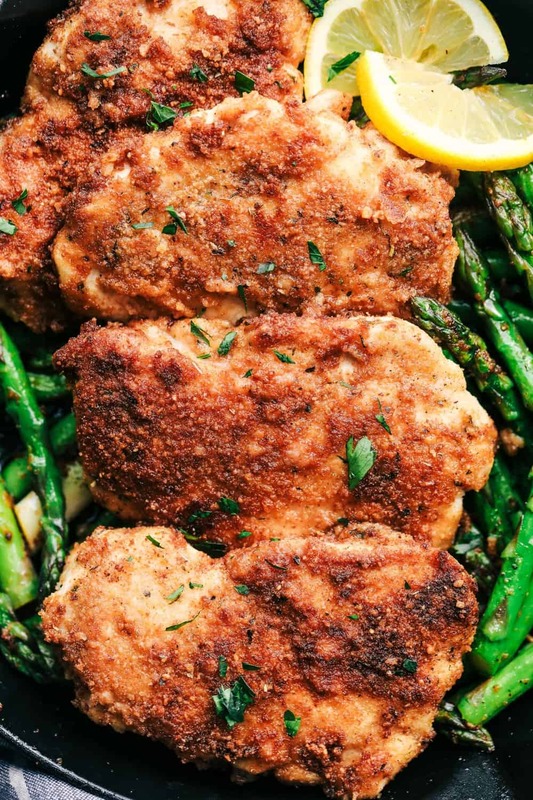 We love the buttery crispy coating on the chicken and the tender asparagus. This makes a great meal in one with the chicken and the veggies. And we love to serve it with some rice and a crusty bagette. 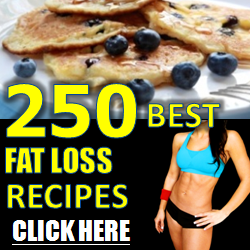 I know that your family will love this meal just as much as we do! 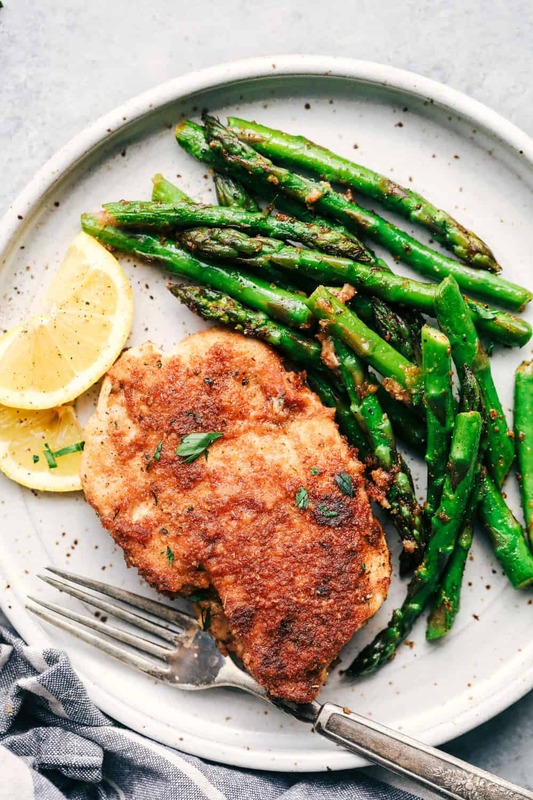 Crispy Garlic Chicken with Asparagus is an easy <g class=”gr_ gr_442 gr-alert gr_spell gr_inline_cards gr_disable_anim_appear ContextualSpelling multiReplace” id=”442″ data-gr-id=”442″>30 minute</g> meal with crispy breaded chicken and crisp and tender asparagus. This is a family favorite meal! In a large skillet over medium heat melt 2 Tablespoons butter. To make the chicken: Melt remaining 4 tablespoons of butter in a shallow dish. In another shallow dish combine bread crumbs, parmesan cheese, garlic powder, and flour. Dip the chicken in the butter and then coat in the bread crumb mixture and place in skillet. Add 2 Tablespoons of butter back to the skillet and saute the minced garlic for a minute. Add the asparagus to the skillet and saute until tender. Salt and pepper to taste and add some 1 Tablespoon parmesan. Add the chicken back to the skillet and heat for a minute or so. Serve immediately.